Submit your Science Demostrator Now ! “We must create infrastructure. Europe’s final transition must be one from fragmented datasets to an integrated European Open Science Cloud. By 2020, we want all European researchers to be able to deposit, access and analyse European scientific data through a European Open Science Cloud”, - the words of the European Commissioner Carlos Moedas for Research Science & Innovation about the European Open Science Cloud (EOSC). The aim of the EOSCpilot Science Demonstrators is to show the relevance and usefulness of the EOSC Services and their enabling of data reuse, to drive the EOSC development. The project invites applications from institutions with interesting challenges that would help define the infrastructure needed by European researchers, while showing the scientific excellence and societal impact that EOSC could achieve. Successful proposals will start on the 1st of July 2017 and will receive support from an EOSC pilot project expert. 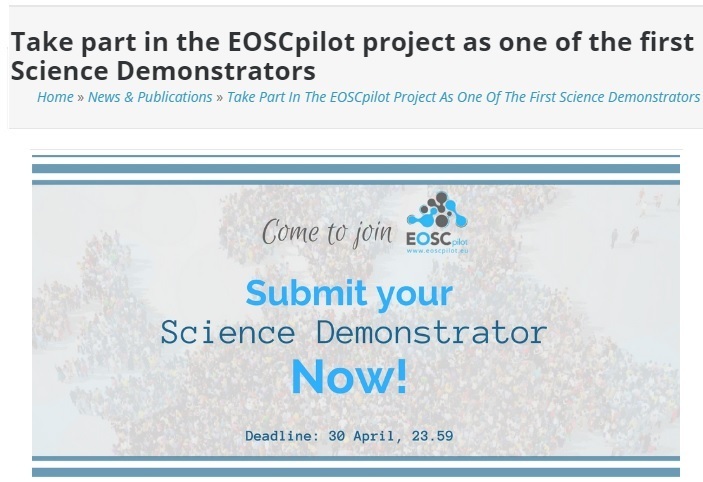 Together, the Science Demonstrator Representative and the EOSCpilot expert will develop solutions, providing the participating institution with more expertise and the EOSCpilot project with a fuller understanding of the needs and requirements for the future EOSC. The Science Demonstrator will have 12 Person Month (PM) [amount of work performed by the average worker in one month] and travel allocated for their work and the possibility to showcase their activities at the 1st EOSCpilot Stakeholder Event in Brussels from the 27thNov- 1stof Dec 2017.
its contribution to achieve a broad range of stakeholders; and its feasibility and suitability to be developed within 1 year with the support provided by EOSCpilot. Register to create your application. The deadline for submission of applications is the 30th of April 2017 23.59 CEST. The applicants will get the result of the call for proposals the 15th June 2017. For support to prepare the application, or for further information, please contact: applications@eosc.eu. Engage with a broad range of stakeholders, crossing borders and communities, to build the trust and skills required for adoption of an open approach to scientific research".